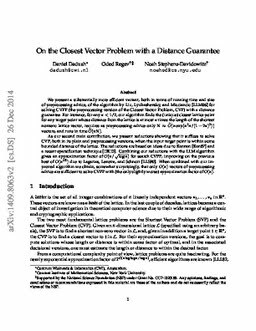 We present a new efficient algorithm for the search version of the approximate Closest Vector Problem with Preprocessing (CVPP). Our algorithm achieves an approximation factor of O(n/√log n), improving on the previous best of O(n1.5) due to Lagarias, Lenstra, and Schnorr . We also show, somewhat surprisingly, that only O(n) vectors of preprocessing advice are sufficient to solve the problem (with the slightly worse approximation factor of O(n)). We remark that this still leaves a large gap with respect to the decisional version of CVPP, where the best known approximation factor is O(√n/log n) due to Aharonov and Regev . To achieve these results, we show a reduction to the same problem restricted to target points that are close to the lattice and a more efficient reduction to a harder problem, Bounded Distance Decoding with preprocessing (BDDP). Combining either reduction with the previous best-known algorithm for BDDP by Liu, Lyubashevsky, and Micciancio  gives our main result. In the setting of CVP without preprocessing, we also give a reduction from (1+∈)γ approximate CVP to γ approximate CVP where the target is at distance at most 1+1/∈ times the minimum distance (the length of the shortest non-zero vector) which relies on the lattice sparsification techniques of Dadush and Kun . As our final and most technical contribution, we present a substantially more efficient variant of the LLM algorithm (both in terms of run-time and amount of preprocessing advice), and via an improved analysis, show that it can decode up to a distance proportional to the reciprocal of the smoothing parameter of the dual lattice . We show that this is never smaller than the LLM decoding radius, and that it can be up to an wide Ω(√n) factor larger.